I chose Little Nellie, my Bike Friday New World Tourist with little wheels, to ride to work. Everything was going along just fine until we hit the mulch pit of death near Teddy Roosevelt Island. Wee wheels won’t work here. So I dismounted. And took a picture. Miles: 29 1/2 (round trip). So I’ve already hit the Errandonnee limit. Observation: Spring bike commuters are starting to appear. They were generally well behaved today. This evening will almost certainly bring out the Lance Mamilots, who ride like asshats only to demonstrate their frail male egos and small man parts. 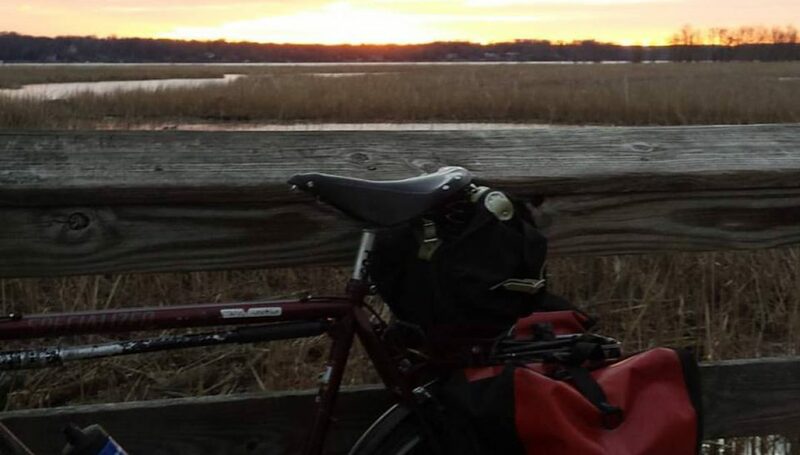 Posted on March 21, 2017 April 1, 2017 by rootchopperPosted in #bikedc, bike commute, Bike Friday, Errandonnee, Errandonnee 2017, Mount Vernon Trail, New World Tourist, springTagged "Mount Vernon Trail", #bikedc, #bikemvt, bike commute, Bike Friday, Errandonnee, Errandonnee 2017, MVT, New World Tourist, spring.